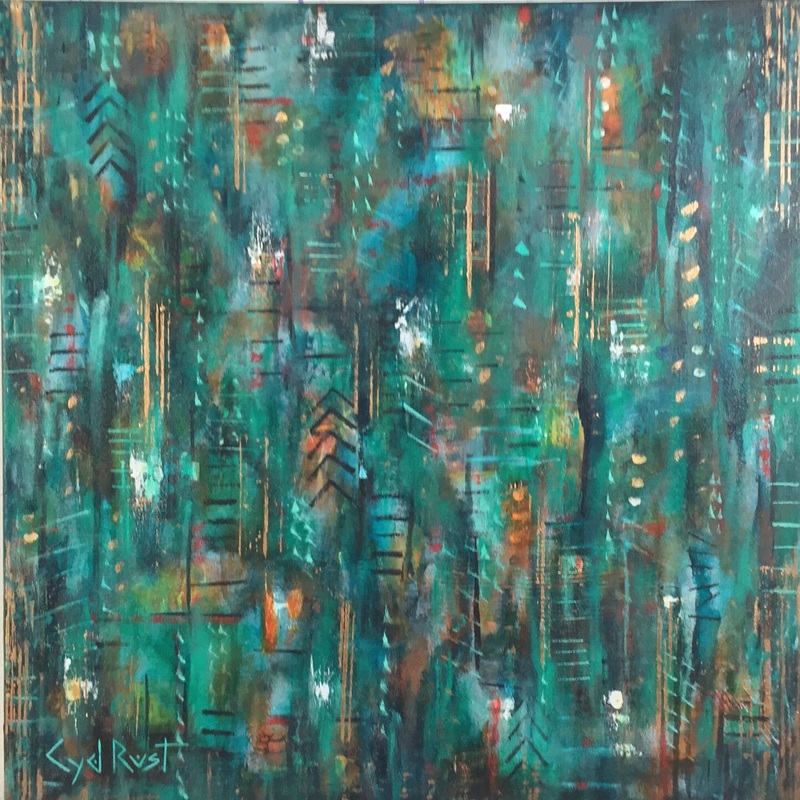 Born in Scottsbluff, Nebraska, Rust describes her early years as “a joyful blend of unrestricted creativity and unconditional love.” Her mother’s side of the family embraced generations of artists, so art came naturally to Rust. She spent much of her childhood at her grandparents’ home. Upstairs, where her grand- mother painted, artists were constantly coming and going, experimenting with every medium imaginable. Downstairs, her grandfather created his own kinds of art. He had a deep love for gemology and fine woodworking. Rust created her first sculpture, a quartz horse head, under her grandfather’s tutelage. When Rust was three years old, she started modelling for her grandmother’s local art guild. Already a budding artist herself, she was nine years old when her grandmother entered Rust in her first juried show. At the age of ten, she won her first award for art. Her father’s job moved the family to Fargo, North Dakota. There, Rust found her artistic outlet not only in music where her sense of rhythm developed as her ability to play multiple instruments increased, but also in her position as Fine Arts Editor of the high school newspaper. After high school, Rust worked at Mt. Rush- more before starting college. It’s no wonder that her love for art, and especially sculpture, stayed prevalent in her life after working at the foot of what is arguably the most famous of monumental stone sculptures. During her free time, she would often go to study Gutzon Borglum’s original maquette, fascinated by his three dimensional planning and mastery of the stone carvings. Rust attended college at what is now Minnesota State University Moorhead. When she was a Sophomore, she married Brenden Rust, who received his degree in mechanical engineering from North Dakota State University. Upon his graduation, the couple moved to the Minneapolis-St. Paul area, where their son Jaimeson was born. A few years later her husband was transferred to Omaha, Nebraska. There Rust found an outlet for her art as a costume designer both for Arabian Horse shows, and for competitive figure skaters. She also enjoyed breeding and showing Arabian and half-Arabian horses. A subsequent move for her husband’s work took Rust almost full circle, to Loveland, Colorado, less than three hours from the town in Nebraska where much of her family still resided. At the same time, her parents and siblings had moved to LA, and later San Diego, California, allowing Rust the opportunity to assimilate to that part of the country frequently as well. When Rust and her husband moved to Love- land, it was considered the “sculpture Mecca” of the United States, containing three busy foundries and a number of independent crafts- men. Inspired again by her artistic surround- ings, Rust immediately began taking classes at the Loveland Academy of Fine Arts, focus- ing on sculpture but also studying drawing, painting, anatomy, art appreciation and pati- nation with world renowned instructors, many of whom also taught at the prolific Scottsdale Artists’ School. She likes to joke she studied enough hours there to earn a Master’s Degree in Fine Art. Rust quickly gathered acclaim as a profes- sional sculptor, even garnering a spot in the prestigious North American Sculpture Exhibition. She became an associate member of the National Sculpture Society and displayed her work in national shows. The couple purchased 35 acres of land west of Loveland, nestled in the foothills of the Rocky Mountains. Rust converted what was to be the show office of her new horse barn into a large studio to allow for the creation of life sized sculptures. In 2002, Rust’s sculpting career was inter- rupted when she was diagnosed with cancer. When she recovered, she found that she no longer wanted to sculpt with brown clays and waxes; she needed color in her life. With all of her childhood time spent painting & drawing with her family, as well as the many courses she had taken at LAFA, the switch to painting was relatively easy. “I love to paint. Often the sun rises and sets, so immersed am I in my work I barely notice,” Rust was frequently heard to remark. Rust rarely uses fine art brushes anymore. 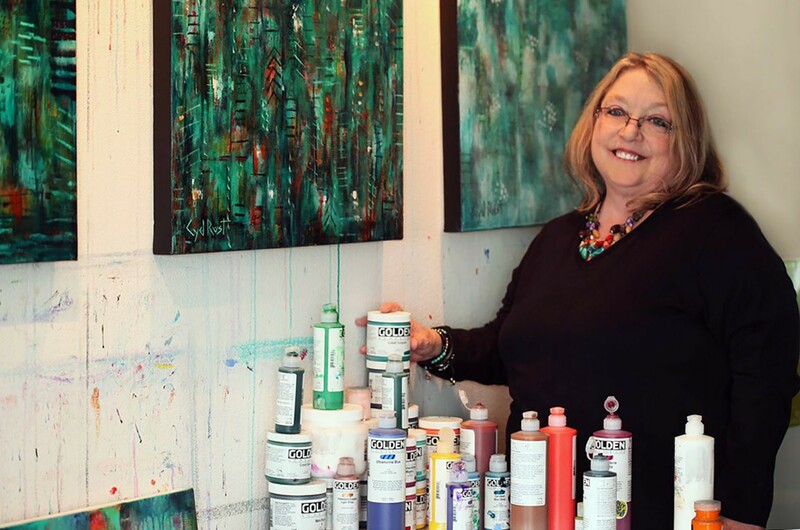 Instead she now creates most of her paintings by finger painting, or using palette knives, foam brushes from the hardware store, and/or what- ever she can find around the house and her stu- dio. Some of the array of items she has used to create her work include coffee cup stoppers, straws, bottle caps, frisbees, rulers, and even bubble wrap. Because of her unique, expressionistic style, Rust is able to employ techniques from various artists she admires. “I love the beautiful glassy layers of Renoir’s washes,” she muses. “I learned how to put down thin transparent layers from him. I love the way Monet used color that must truly be seen in person. I adore the china doll faces of Gustav Klimt’s women against the abstract array of color and marks on clothing that could just as easily have been on an Egyptian tomb. (I actually started a notebook with all the marks he used in his paintings. It was a happy awakening of marks of the ancients.) I am very pulled by Wassily Kandinsky and his colors and lines. I like the architectural look to his work, yet with beautiful color. Of current day artists, I am proud to have studied intensely under the amazing color genius, Stephen Quiller, and will probably never know how much he has influenced me. I learned more about Trans- parent and Translucent colors from Arleta Pech, who has managed using them to stunning degrees in both watercolor and oils. 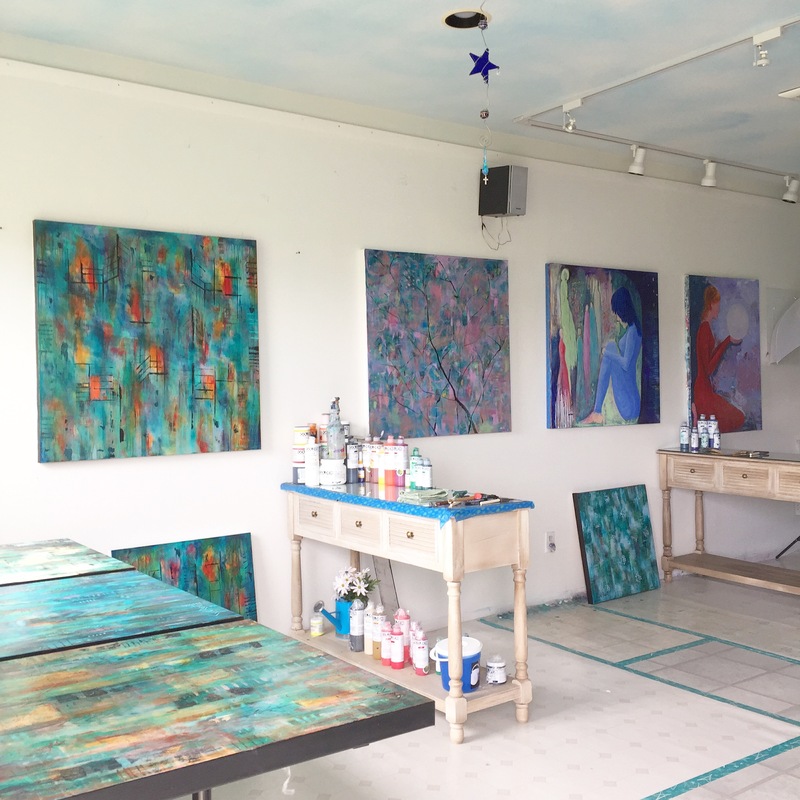 Most recently I have studied what is being called Intuitive Painting with Flora Bowley. In 2010, one of Rust’s paintings was selected as the cover for a national art show and was featured on the show’s poster and in its catalogue. 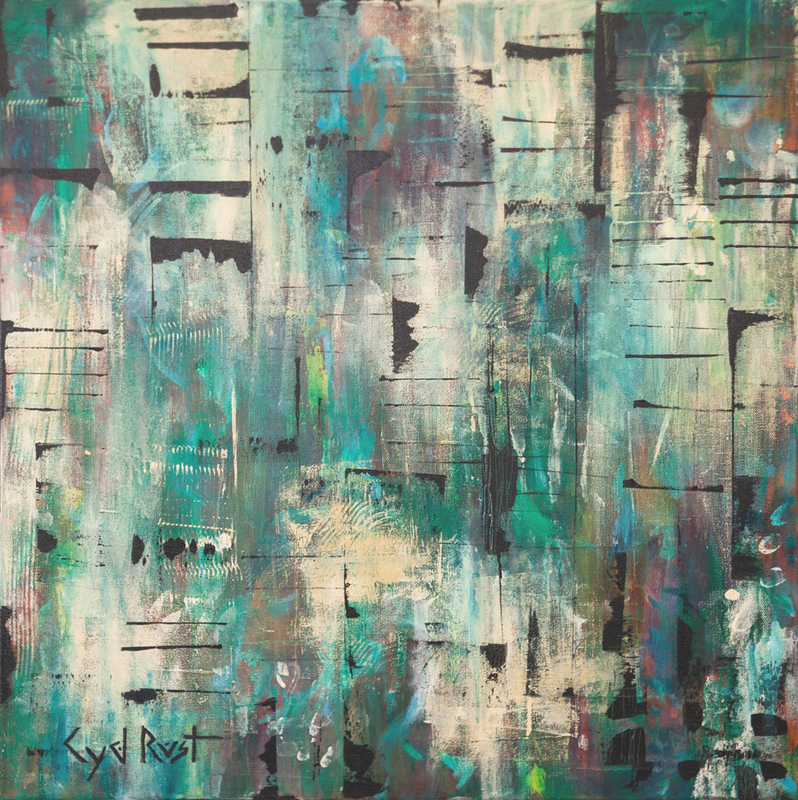 Rust’s paintings have also won numerous regional awards, and she holds the rare distinction of having been in national shows for her paintings as well as her sculptures. She has been in several shows and exhibitions, including being invited to participate in the 2014 Richard Schmidt/Rist Canyon Fine Art Juried Auction. Also in 2014, Rust had two solo small works shows in Fort Collins, Colorado. Rust has been spending time recently adding to her portfolio and teaching workshops. In 2016 Rust was accepted into the National Association Of Women Artists, Inc. Her Induction into the group will take place in November. Viewers of her art have called the colors “beautiful” and say that they get lost in the images, constantly finding new colors, marks, and patterns they hadn’t noticed before and truly experiencing the cloud watching element of Rust’s work. When Rust is not painting or teaching a workshop, she can often be found walking along the lake with her husband, playing with their Havanese puppy “Pablo”, or practicing yoga. When asked about her mission as an artist, Rust replies that it is threefold: “To Create, to Share, and to Care. To Create paintings that both intrigue and inspire the viewer, to create works that make “art- play” something not to be feared by the general public but rather allows them the opportunity to share in the almost magical joy I experience while painting.